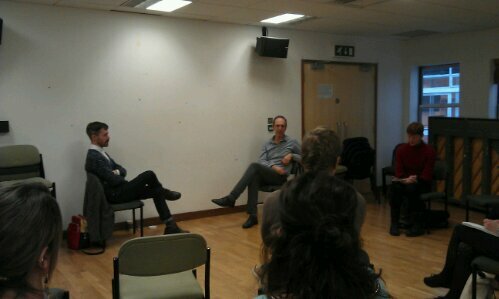 Rachel Oxley reminded me about this Quorum seminar at Queen Mary’s Drama Department. It was a fascinatingly rigorous conversational fail. In this practice-based session Frank and Martin will continue their ongoing series of encounters exploring the possibilities of conversation as a staging of discursive practice. This Quorum promises to be of particular interest to all those interested in the articulation between practice and discourse, and looking at alternative and/or practice-based ways of approaching theory. After the session we will be going for dinner at the Greedy Cow. Please RSVP by end Tuesday if you would like to join us so we can get an idea of numbers. Frank Bock is an independent artist and psychotherapist. He was a founder member of the Featherstonehaughs Dance Company and worked with them from 1987 to 1998. With Simon Vincenzi, he was co-creator and director of Bock and Vincenzi, a project-based company that created six productions. From 1999-2007 Bock and Vincenzi researched and developed a body of work under the title ‘invisible dances’, in which memory, communication, death and disappearance were recurring themes. From 2008-2001 he worked as Creative Associate with the Cholmondleys Dance Company. He has also worked with Graeme Miller, Wendy Houstoun, Miranda Pennell, Bobby Baker and Rosemary Lee. Since 2006 Frank has practised as a psychotherapist, working in private practice, and with MIND as an assessor and clinical supervisor. Dr Martin Hargreaves is the editor of Dance Theatre Journal and leads the MA Dance Theatre: The Body in Performance at Trinity Laban. His research interests lie between hysteria and boredom, and his current practice centres around the reconstruction and reimagining of seminal performance works from the 1960s. About 25 people sat in the ‘rehearsal room’ in the Arts building at queen mary, which is a standard seminar-format non-space with whiteboards, a ceiling projector, and full of schoolroom tables – flattened to the wall to make room for an improvised semi-circle of seats with about 4 sparsely populated rows of spectators. The table at the back of the room had an assortment of snacks, wine and juice, and a small video camera set up on a photography tripod pointing towards the two conversationalists. They sat facing each other, oriented at roughly 10 degree angles to the audience, looking rather uncomfortable until people stopped milling about and Quorum convener Rachel Gomme introduced them both and kicked off the 45 minute conversation. I describe all this in detail because it’s hard to put across how comprehensively the specific context and set-up of the room, the premise and the practical features of the setting seemed to undermine any semblance of conversation that would be recognisable as such from a pragmatic or interactionist perspective. I’m using the words ‘fail’ and ‘undermine’ here without meaning to give them the perjorative force they imply. Both Frank Bock and Martin Hargreaves explained the possibility or even the inevitability of them failing to have a conversation in front of the audience as an intentional part of the event. The most obvious fail started with a long awkward silence after Rachel’s introduction, which was recognisable as a dramatic device that built tension between an expectant audience and two present but silent performers. The intensity of this interaction between audience and performers was palpable as people laughed (with release) when the two finally began a highly contrived (in form, if not in content) debate on the subject of the situation, its awkwardness and what it means to have a conversation with each other as research. The content of this discourse seemed immediately at odds with the form it took. They talked about how the dynamics of conversation thrived on misunderstanding, but their slow talk and clear projection seemed to mitigate strongly against mishearing. Alongside meta-commentary from both of them about their emotional reactions to the situation and senses of self-consciousness, Both continually asserted that the conversation was between the two of them, not involving the ‘audience’, as they called us. However, their explanations and the people, places and things they referred to were continually explained in full – names and sirnames of common acquiantances and events spelled out in a way that would have been completely unnecessary if the two of them had been having a more naturalistic interaction. I looked around at other people in the room repeatedly, and this performed discourse seemed to be engaging them. Some listened attentively, eyes front, some smiled or made notes. I had a particularly loud piece of paper on which I took notes and I could almost feel the ripple of awareness spread around me marking each noisy note. I could certainly hear – almost feel – other people doing the same. The conversationalists gestures were very muted, their orientation towards each other and the audience hardly changed at all during the entire 45 minutes. As the seminar progressed, Martin Hargreaves began talking about the idea of conversation as an artwork that “has no object other than itself”, and talked about this as part of his artistic practice of non-documentation (while pointing out the video camera documenting this event from the back of the room). Frank Bock responded to Martin Hargreaves’ professional-status-talk by directly raising the supposed fact of their equality in this situation, even stressing that a non-hierarchical relationship existed between the two of them and the other people in the room. Although on some level this is true, the assertion of equality seemed completely at odds with the epistemological hierarchy implicit in the set-up of the room, the orientation of the auidence, and the intentional construction of the situation. But by now this was becoming a familiar trope in this performed conversation: statements, assertions or refutations at odds with the apparent processes and activities being played out in front of us. Frank Bock followed up his assertions of equality by bringing up his own professional role as a therapist “I’m still the therapist”… “only you’re not paying me”. A further extended meta-commentary followed about their respective conversational roles (Martin Hargreaves as a teacher, Frank Bock as a therapist) and to what extent they were performing them here. In a very polite, performative and roundabout way, they did seem to be asserting their own epistemological authority in relation to one another, culminating with another non-non-statement by Martin Hargreaves: “I’m trying not to deliver a lecture to you”, delivered at the end of something that sounded very much like an authoritative lecture. During this exchange, Frank Bock came up with a nice turn of phrase describing wanting to ‘fall into a conversation’, but having a sense of ‘heldness’ in relation to the audience. He then began to break down the fluency of his talk, which had previously been marked by contemplative pauses, ponderous diction and an absence of umming and errring. Again, this was thematised in the content of his talk, “speaking from a place with no words”, “groping for the right word”. Martin Hargreaves, who had got a big laugh from the audience in relation to an off-the-cuff sexual innuendo about flirtation and seduction, pursued that line, fishing for similar responses, and then thematising that by stating (again, counter-intuitively) that he was aware of trying not to play for laughs. At this point I started to lose interest, the dynamics seemed somehow established, and I noticed that several audience members were now playing with their phones. Note taking had ceased, no more noisy scribbling was happening, and notebooks were closed on laps. People around me seemed distracted and fidgety. I began playing with my phone too. Then I remembered to listen in to their conversation again, which I had tuned out in my distraction. I heared them referring to people I didn’t know about by first names, and talking in less distinct voices, overlapping more, gesturing, with shorter pauses between speaker turns. They seemed to have finally relaxed (‘fallen’) into having something that looked more likeconversation, which was paradoxically marked by disinterest from a fidgeting, mobile phone thumbing and seemingly impatient audience. This was no longer directed at them, but was heating up for the two conversationalists, who seemed to be enjoying themselves by now. Finally the fidgeting turned into overt signalling from Rachel Gomme and they slowed down towards what felt like an immanent end, meta-commenting about how they had primed this conversation with rehearsed content from prior (private) conversations, and that they would now like to ‘debrief’ about this conversation – although they might then need to ‘debrief’ about the ‘public debrief’ in private afterwards. A sincere but somehow ambiguous round of applause sealed the end this fascinating and recursively problematic performance conversation. I came away from the experience with a sense of bewilderment about the thinking and preparation behind the performance. How is it possible to fail to have a conversation so rigorously? Of course I’m talking about conversations in terms I would recognise from my research context, which broadly speaking, means that they should be ‘amenable to the basic tools of conversation analysis’. For example, a conversation would exhibit recognisable patterns and sequences of turn-taking, repair and other features of talk-in-interaction. It also provided me with a profound appreciation for all the different ways we have of talking about talking in English. I’m not sure whether such a rich descriptive lexicon exists for many languages, but when I thought back to what I had witnessed, it seemed like a discourse seguaying into some repartee, followed by negotiation, then a proper chat, followed by hob-nobbing over wine. And in each of thse were another ten or twenty conversational forms, each more or less oriented to an audience, to performing a kind of epistemic struggle, improvising, joking or pontificating to each other and the audience. I am writing this short, mostly unsubstantiated rant to help me clarify some of my first steps at reading and thinking about aesthetics and pragmatics in relation to my thesis. One of the first questions I’m having to answer is why a theoretical abstraction such as aesthetics has anything interesting to bring to a study of the pragmatics of dialogue. I understand ‘pragmatics’ to refer to a broad set of approaches to the study of human communication and interaction that emphasise the uses of linguistic signs as opposed to their ostensible meanings. For example, conversation analysis (CA), an observational approach to the study of talk-in-interaction involves creating highly detailed transcriptions of the utterances of people in conversation, then asking what they are doing by looking at regularities and exceptions in the organisation of pauses, overlaps, nd the contingent outcomes of their talk in building social action with others. Typically, a pragmatic approach eschews analyses based on a disembodied or decontextualised semantic analysis of what is being said, and by extension, any assumptions or inferences that might be drawn about the intentions or internal, unexpressed emotional or psychological states of the people interacting. Only observable phenomena are considered. What you see or hear, in other words, is what you get. Aesthetics in the philosophy of art traditionally seeks to determine how we perceive, interpret and judge artworks. In most approaches to Aesthetics, it is assumed that something can be meaningfully described as art, whether by dint of specific formal or perceptual qualities, by historical or institutional conventions, or by virtue of some broader relationships it entails between people, spaces and objects. Because of the high semantic level at which many aesthetic theories operate when compared to the painstaking micro-analysis of communication in pragmatics, these approaches may seem incompatible. However, what I am arguing here is that aesthetics and pragmatics share a linchpin concept in their uses of ambiguity as a strategy. One of the key concepts in pragmatics is the view that all communication is best understood as an effort to overcome ambiguity. The term ‘speaker-meaning’ is sometimes used to describe what is intended in the production of an utterance. Once the utterance is ‘out there’, however, its meaning to any specific listener becomes analytically ambiguous. The study of talk-in-interaction most often focuses on misunderstandings and breakdowns of communication because often it is only in those instances that any evidence of efforts made to rectify, check or correct the ambiguity becomes observable. The strategy of ambiguity in aesthetics is a longer and more tortuous story. Aesthetics in the sense outlined above arguably begins with Hume’s and Kant’s epistemological questioning of perception and cognition, and has often returned to a central question of defining art. Although articulating the necessary or sufficient conditions for something to be called art has become a philosophically scorched-earth, it is one of the most enduring and widely engaged-in problems in the field, and is one of the few issues in aesthetics likely to be discussed in a daily newspaper or in everyday conversations about art. Paul Oskar Kirstellar’s 1951 paper “The Modern System of the Arts” investigated the taxonomy of ‘fine art’ as a distinct set of practices including sculpture and painting but not, for example, basket weaving. This article is often cited as one of the first explanations for the 18th Century formation of the institutions of art and the figure of the artist as an autonomous practice enacted by an individual genius, distinct from the patronage of the church. Kristellar’s explanation that the expanding mercantile cultures of European imperialism shaped the role and the commodity status of the artwork, whether accurate or not, paved the way for a critical re-evaluation of the artwork and the artist as social constructions. For example, critic Arthur Danto’s concept of ‘The Artworld’ (1964) and subsequently George Dickie’s “Institutional Theory of Art” (1969) describes art as a specific set of institutional relationships that determine and regulate the boundaries of what is considered to be art. These aesthetic theories have a useful explanatory function for describing how, arguably starting with Duchamp, a core activity of artists in this historical/cultural context has been to challenge the boundaries of what can be considered art. The ambiguity of the socially determined status of the artwork is seen as a means of questioning the social institutions that can confer this status. By revealing the ambiguity or arbitrariness of the linguistic/behavioural norms that inculcate the assignment of the art status, by extension artists and their artworks call into question other socially assigned statuses. Since what Lucy Lippard has described as the ‘dematerialisation of the art object’ in the late 60s, contemporary art practices have purposefully manifested a deliberate ambiguity as to the status of their artworks. For example, Warhol’s re-use of pop-cultural artefacts is a direct play on this ambiguity, teasing out the use-value, symbolic and ritual values of brand identities, alongside their ‘special status’ as art objects. Warhol saw the art status as especially useful in that it enabled the oscillation of function and value between the artworks’ statuses and multiple value systems. Similar uses of ambiguity may have been a feature of, for example, the Baroque trompe l’oeil. However, this recent iteration of ambiguity as a strategy in art seems crucial to an account of how contemporary aesthetic theories and practices position themselves as ‘critical’ or ‘experimental’. Allan Kaprow’s happenings, John Cage’s compositions, Yvonne Rainer’s street choreographies, all play on the ambiguity of their functions and interpretations as a form of reflexive ontological destabilisation. They intentionally call into question their status as artworks as a component of their expressive or explanatory gesture. The way Kaprow’s happenings unfolded, without a clear beginning or end was central to their power to call into question and into aesthetic/political discourse the activities that occurred before and after the period of their ‘happening’. Cage’s compositions use noise and silence to question institutions of listening. Rainer’s dances problematise normative interpretations of bodily movement. “in Aristotle’s sense, notions or theses with which people argue, but over which they do not argue”. For example, artists such as Sol Lewitt began working with artworks mediated as instructions to be enacted by participants, introducing a further layer of ambiguity as to the relationship between the conceptual author of the artwork and the indexical link between the painter’s hand, brush and wall. Practices such as Art and Language, or the Artists Placement Group in the 70s and 80s, recognising the new epistemic priority of language and interaction in art, extended the logic of dematerialisation of the artwork and its critical functions respectively to focusing on the linguistic means of art’s social production as material, and to its broader institutional relations. Situationist, Mail-art, Neoist, participatory/community art, installation, interventionist and networked art practices have further extended what is often referred to as the dissolution of art into everyday life by applying this status-critique to litigious questions of authorship, revealing the contradictions of legally assigned moral rights to works, the limits of acceptable behavioural and representational norms, and the reflexive, critical refractions of meaning made manifest by the distribution of artworks through systems of governmental or commercial communication. Alongside visual art and participatory/performance art practices that foregrounded the destabilisation of art and other institutions as linguistically constructed, critical/epic theatre thematised the pragmatics of everyday communication on stage. Brecht’s halting, grating dramatic dialogues are almost faithful transcriptions of the naturalistic fragmentation of discourse in conversation. The way they eschew the conventional theatricality of stage-speak by highlighting the gaps, disjunctures, misunderstandings and half-spoken modes of everyday talk elicits a kind of vertigo response to the ambiguity at the heart of everyday language and interaction. Adorno argues that pedagogical function of Brecht’s plays are to take this vertigo home with them and use it as critical standpoint from which broader social constructions such as political and ideological absurdities. More recently, artists such as Tino Sehgal have experimented with deploying human interaction as artistic material, introducing performative devices which he and his producer Asad Raza refer to as ‘conceits’ that manipulate face to face communication in specific ways. For example, in his piece “This Progress” in the New York Guggehneim museum, Sehgal empied the gallery of its existing collections, and employed a large group participants to deploy a few specific timed conceits to lead gallery visitors through a series of otherwise impromptu interactions. At one point in the exhibition, Raza describes the visitors approaching a single-person-width corridor, intended as a transition-point between one conversational guide and another. In preparations for the show, after struggling to negotiate the interactional complexity of inviting the visitor to pass through in front of the participant, which invariably led to an unpredictable confusion of politeness, Sehgal found that if they instructed the participant leading the visitors to make a very small, specific gesture, standing adjacent to the entrance, arms by sides, and offering a palm-up forearm gesture, visitors would generally allow themselves to be waved through. This simple gesture is only one in a library of interactional devices, deployed in context-dependent ways in Sehgal’s ‘interactional’ artwork, that treads a fine line between orchestrated and improvised movement and dialogue. In this context the status-ambiguity of the interaction in which participants and gallery visitors are engaged becomes embedded in the way they talk to each other. A conversation about a gallery visitor’s experience, which in everyday talk might have a certain set of conversational dynamics and characteristics may be modified by unusual conditions (for example, if it is considered and treated as an authored artwork) as it is performed. Although the question of whether Sehgal’s work counts as art is not interesting for a professional aesthetic enquiry, this purposeful fostering of the art-status-ambiguity of human interaction itself makes his practice a tractable subject for interactional research. If pragmatics sees meaning as embedded in the uses of things, then what can we find out about a conversation or an interaction when it is used as art? Even asking this kind of question seems ridiculous without the specific historical and contextual understanding of ambiguity in art briefly outlined above, and it may turn out that this research in the pragmatics of aesthetics finds no sufficiently solid ground or tractable objects from which to launch an analysis. However, reading Harvey Sacks’ (one of the founders of Conversation Analysis) 1973 paper “On the preferences for agreement and contiguity in sequences in conversation”, there are some striking contemporaneous parallels with Lucy Lippard’s ‘dematerialisation of the art object’. In this paper, Sacks continually refers to the conversational devices he observes such as conversational turns, sequences of utterances, and even the affirmative token Yeah as conversational ‘objects’. He refers to the complex patterns he finds in talk as ‘machinery’, for example, the “machinery for dealing with misunderstanding” and other “technically interesting objects” or “apparatus” that exhibit “fully formal and methodic potential”. In this way Sacks’ analytic practice transforms ‘materialises’ language as an object of study. As a deliberate epistemological break from the dominant sociological theories and formal linguistic approaches of the time, Sacks sought ways to materialise language and human communication in order to apply empirical methods to its study. Central to that effort was a recognition of the fundamental ambiguity of human communication, and a commitment to gathering evidence of failures in communication to show how people work to overcome that ambiguity. In the same intellectual climate, art practices that had traditionally ascribed artistic meaning to the objects they produced in relation to traditions and aesthetic theories began to adopt increasingly linguistic or interactional forms and contexts, seeking to build ambiguity into the social material from which their work was made as a deliberate critical strategy.